Higashiyama T. et al. (2001) Pollen tube attraction by the synergid cell. Science 293, 1480-1483. Mori T. et al. (2006) GENERATIVE CELL SPECIFIC 1 is essential for angiosperm fertilization. Nature Cell Biol. 8, 64-71. Nishimura Y. et al. (2006) Active digestion of sperm mitochondrial DNA in single living sperm revealed by optical tweezers. Proc. Natl. Acad. Sci. USA 103, 1382-1387. 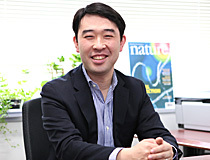 Higashiyama T. et al. (2006) Species preferentiality of the pollen tube attractant derived from the synergid cell of Torenia fournieri. Plant Physiol. 142, 481-491. Ingouff M. et al. (2007) Distinct dynamics of HISTONE3 variants between the two fertilization products in plants. Curr. Biol. 17, 1032-1037. Kanaoka M.M. et al. (2008) SCREAM/ICE1 and SCREAM2 specify three cell-state transitional steps leading to Arabidopsis stomatal differentiation. Plant Cell 20, 1775-1785. 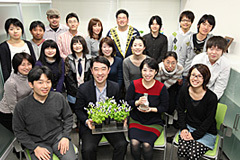 Sasaki N. et al. (2009) The Plasmodium HU homolog, which binds the plastid DNA sequence-independent manner, is essential for the parasite's survival. FEBS Lett. 583, 1446-1450. Okuda S., Tsutsui H., et al. 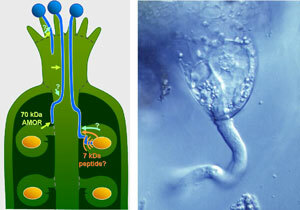 (2009) Defensin-like polypeptide LUREs are pollen tube attractants secreted from synergid cells. Nature 458, 357-361.